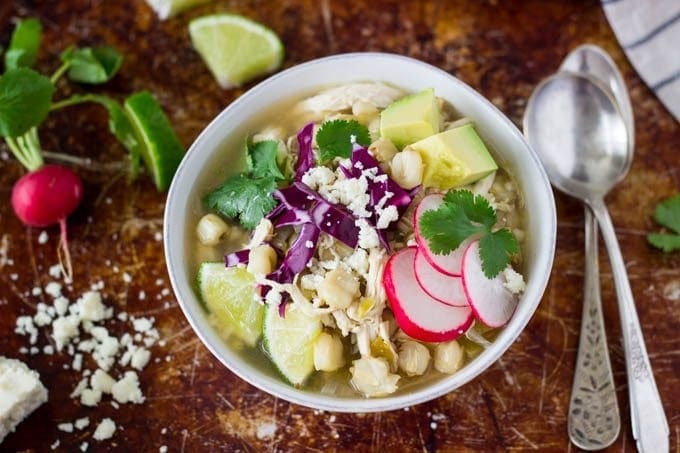 This easy chicken posole (or pozole) takes only about 5-10 min prep time and can be slow-cooked for hours in the crockpot or if you prefer can be cooked on the stove-top in less than 30 min. Tender bites of shredded chicken, hominy and green chiles in a flavorful/spicy broth. Topped with avocado, sliced radishes, crispy cabbage , queso fresco (Mexican crumbling cheese found at most grocery stores), fresh cilantro and a squeeze of lime. 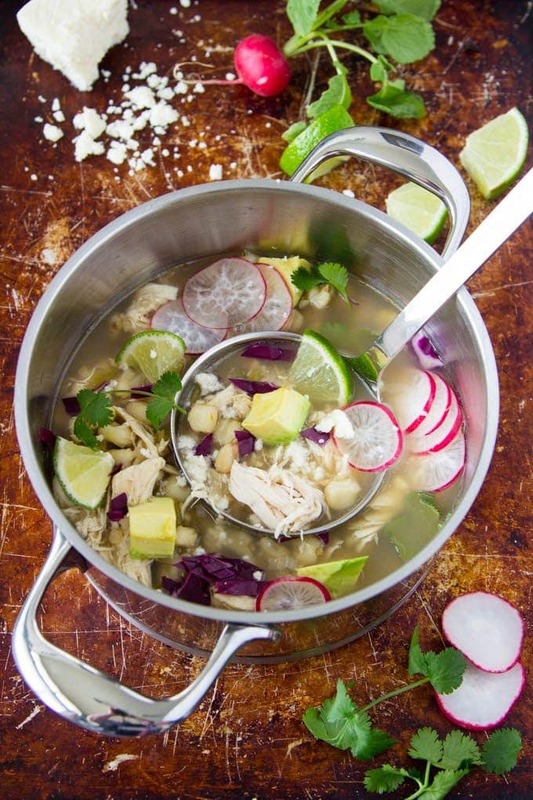 What I love about chicken pozole is the combination of tastes and textures you get in each bite of this hearty soup/stew. 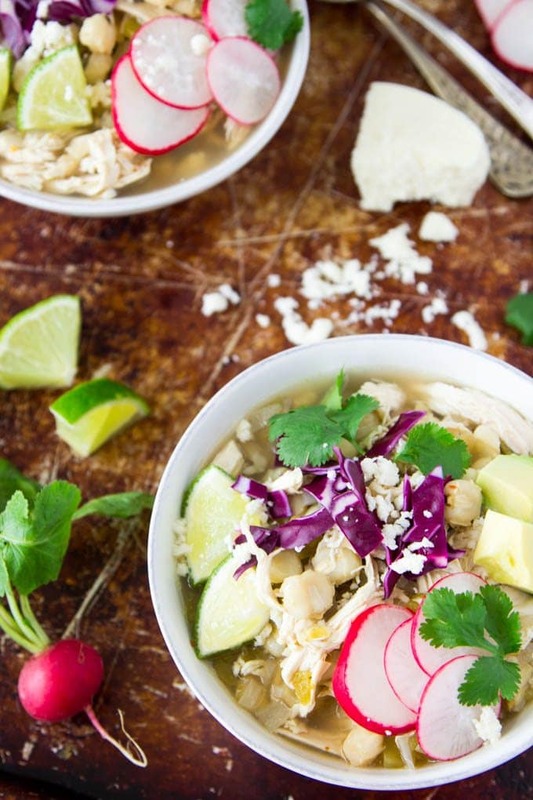 A kick of spicy from the broth and chiles, a bit of chewy from the hominy and chicken, some crispy from the cabbage and radishes, creaminess from the avocado and a bit of brightness from the cilantro and lime. All of that = a tasty Mexican meal! Depending on your schedule you can prepare this flavorful soup in a crockpot and let it simmer away all day or whip up a batch in about 30 min. on the stove-top. Either way it’s super SIMPLE. Just one pot needed (crockpot or soup pot) . All the ingredient (except toppings) go in at the same time and simmer 4-6 hours for the crockpot or about 30 min for the stove-top. I’m cooking up the chicken in the broth (using skinless chicken (breast/thighs) on the bone for the crockpot and skinless boneless (breast or thighs) for the stove-top ). Simply removing the chicken from the pot once it’s cooked thoroughly , let it cool for a few minutes and shred the chicken with two forks. As an alternative you could also use 3 cups of rotisserie chicken. Toppings! Chicken Posole definitely needs toppings! For all those reasons I mentioned above…the flavor/texture combination is just the bomb! I’m using avocado, cabbage, sliced radishes, cilantro, queso fresco and lime wedges. Some other options you may want to try: crispy tortilla chips, green salsa, chopped green onions, cojita cheese or sour cream. Combine broth, chicken, onion, garlic, green chilis, cumin, salt, pepper, red pepper flakes, hominy and poblano chile (if using) in a 5 qt. crockpot/slow-cooker on high for 4 hours (or low for 6 hours). Before serving remove chicken from crockpot with tongs or a slotted spoon. Allow to cool for a few minutes. Using two forks shred the chicken. Add back to the crockpot to warm up the chicken. Serve in bowls and top with desired garnishes. Heat a small amount of olive oil in a dutch-oven or stockpot over medium-high heat. Add onions and cook (stirring occasionally)until tender (about 5 min.) Add broth, chicken, garlic, green chiles, cumin, salt, pepper, red pepper flakes, hominy and poblano chile (if using). Cook until chicken is cooked through (about 10-12 min.) Once chicken is cooked remove from the pot with tongs or a slotted spoon. Allow to cool for a few minutes. Using two forks shred the chicken. Add back to the dutch-oven to warm up the chicken. Serve in bowls and top with desired garnishes. * For crockpot version- I suggest using bone-in (skinless) chicken. Either bone-in breast or thighs. Both are easy to shred and in my opinion the chicken stays more tender when cooked on the bone for longer cook times . For stove-top version-I suggest using boneless (& skinless) chicken breast or thighs. Recipe has instructions for shredding chicken. If you prefer you can cut the chicken into cubes and add cubed chicken when you add the broth and other ingredients. Different! Looks real good,need to add to my growing healthy recipe list!